Mikayla Kapp photo STATUES WERE SEEN FROCKED in coats outside the education and natural resources buildings Wednesday. Unkown individuals must have decided they needed protection against the single-digit temperatures. See page 10 for today’s weather report. In brief Election protests flare up in Ukraine Ukrainian pro-European Union protest leaders have issued an ultimatum against President Viktor Yanukovych, according to the BBC. Opposition leader Vitali Klitschko said if the government refused to call off snap elections, he would lead protestors in an attack. “Tomorrow, if the president does not respond … then we will go on the attack,” Klitschko said in front of tens of thousands of protesters in central Kiev on Wednesday. The conditions the Ukrainian defense wanted met were for the government to call off the snap elections and to lift the new antiprotest laws. The whole conflict started in December with demonstrations in favor of joining the European Union. “If this does not happen happen, we will march forward together. If it’s a bullet to the head, then it’s a bullet to the head,” Klitschko said. Jeff Dahdah photo BRIDGERLAND SQUARE is under construction for the new lot to house Al’s Sporting Goods, Natural Grocers, Five Guys Burgers and Fries, Dunkin’ Donuts and Firehouse Subs. Russian terrorist Doku Umarov has threatened the Sochi Olympics, although U.S. intelligence cannot confirm if he is still alive, as reports have been made that Umarov is dead, according to CNN. Umarov called the Olympics “Satanic dances on the bones of our ancestors.” Experts say terror plans on the Sochi Olympics may have already been launched by Umarov, who has been battling Russian government forces since 1994. Experts say if he is dead, he will be replaced. The U.S. has stepped up its involvement in security and has been talking with Russia to combine technology to protect the Olympic games. Secretary: U.S. debt ceiling limit looms U.S. Treasury Secretary Jacob Lew sent a warning to congress on Wednesday that the government would exhaust its ability to in late February. The warning comes shortly after Congress passed its first bipartisan budget and comprehensive spending bill in years. In the letter addressed to Boehner and other congressional leaders, Lew said the increase in spending coming in February due to 2013 tax refunds would leave the treasury with little budget after the official debt limit is reached on Feb. 7. Today From Page 1 program started in 1992 at Pennsylvania State University. Student leaders felt their campus was living in a bubble and knew informed students should go hand-in-hand with education. Since then, 400 campuses have implemented the program. “Part of the whole purpose is to get students reading,” Almanza said. “To prepare to be global citizens by being informed citizens, you’ll become much more of a global Would you read USA p o w e r house.” Today on campus? The proTell us at gram would utahstatesman.com not come with online access. Several students said they read their news online, whether it’s from a news website or a form of social media. Before the executive council makes a decision, it requested specific numbers about readers and usership. way in the imagination — that the man who has led the brutal response to his own people could regain the legitimacy to govern,” said John Kerry, the U.S. secretary of state. The talks will move to Geneva on Friday. The policy of The Utah Statesman is to correct any error made as soon as possible. 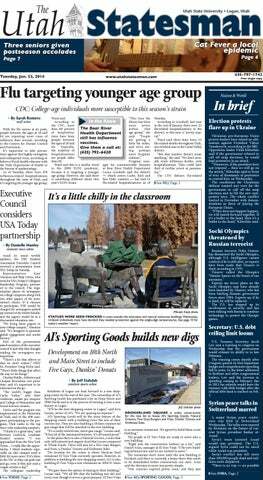 If you find something you would like clarified or find in error, please contact the editor at 797-1742, statesman@aggiemail.usu.edu or come in to TSC 311. It wasn’t a case of a random shooting. It was a targeted incident. It’s one of the things you hope doesn’t happen, but it did. Shortly after ordering a campuswide lockdown, University of Oklahoma officials said Wednesday there was no sign that shots were fired on campus and no reported injuries _ but the brief alert, police response and emergency warnings to shelter in place have become an all-too-common drill at campuses across the nation “As of this time, no evidence has been found of any shots being fired” on the Norman campus, Catherine F. Bishop, the university’s vice president for public affairs, said in a statement. “There are no injuries reported at this time. Both the Norman and OU police departments have very quickly responded as well as emergency personnel. President (David) Boren is at the scene. Normal campus operations have resumed except for Gould Hall where additional checking is continuing.” The Oklahoma incident comes one day after a student was fatally shot inside a Purdue University engineering building. A suspect was arrested, and the day ended with a candlelight vigil for the slain student. Los Angeles Times staff writers Molly Hennessy-Fiske and Matt Pearce reported on the hyper-vigilance and federal requirements that drive school officials throughout the country to readily report and respond to possible threats. Over the last year, high schools, middle schools and even elementary schools have been crime scenes. Many students who arrive at college campuses today are familiar with lockdown drills, The Times reported. College police chiefs note that federal law requires them to promptly notify campus communities of possible threats, sometimes before investigators have time to learn whether the threats 71413are credible. cine, and remember personal hygiene,” Ward said. “People don’t think about where germs are spread. Pencils, pens, iPhones, light switches; wipe them off and wash your hands especially.” Goodsell said the Bear River Health Department still has flu vaccines and recommends getting immunized. “The vaccination is 70-90 percent effective,” she said. “People that are vaccinated, if they get the flu, it’s not as severe and it doesn’t last as long.” BRHD accepts multiple insurances and welcomes walk-ins. It is open Monday through Thursday from 8 a.m. to 6 p.m. and Friday 8 a.m. to 1 p.m.
sexually assaulted, the majority by men amid a significant rise in federal complaints filed by students across the they know. The report, by the White House country under Title IX, an anti-disCouncil on Women and Girls, identi- crimination law that requires impartial fied college as a particularly risky place investigations of assault allegations, and for women, noting that campus rap- the Clery Act, which mandates accurate ists are often repeat offenders. Obama reporting of campus crimes. called on college presidents across the There were 30 Title IX complaints involving sexual viocountry to do more to lence in 2013, up from prevent the assaults. Barack Obama 11 in 2009, accord	W e d n e s d a y ’ s ing to the Department announcement was U.S. President of Education, which seen as a victory by enforces the law. many college activ	In California, stuists, who have orgadents have filed fednized online in recent eral complaints against years to file federal USC, Occidental College complaints against and the University of administrators. “Having Obama come forward in California, Berkeley alleging the schools such a public way is demanding a pub- discouraged victims from reporting lic shift,” said Alexandra Brodsky, a law their assaults and bungled the investistudent at Yale University who co-filed a gations required by the anti-discrimiTitle IX complaint against the school in nation law. Administrators have been more focused on protecting their public 2011. “With one report, one public state- images than their students, the comment, and the power of his office, plaints say. President Obama just changed the In September, Occidental came to a course of sexual violence on campus,” monetary settlement with at least 10 said Caroline Heldman, a politics pro- women who were part of the federal fessor at Occidental College — Obama’s complaint. alma mater — who has helped student State legislators have proposed new reporting laws for public campuses. activists organize. “We have a long way to go in this In November, state auditors launched struggle, but campus administrators a review of four California campuses: will no longer be able to drag their feet, San Diego State University; California retaliate against survivors and enact State University, Chico; UCLA and UC superficial instead of actual changes,” Berkeley. Amid the scrutiny, evidence has mounted that colleges have failed to she said. The presidential spotlight comes comply with the federal laws. ready to start construction. The shopping center will open up a lot of jobs for students at USU both in Al’s and in the new buildings, according to Larsen. “We’ve done very well. 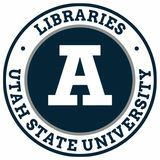 We’ve got 100 employees, many of which are students at Utah State,” Larsen said. “We graduated from Utah State. We love USU.” The whole project will still take some time, and Logan residents shouldn’t expect construction to be done for a few months, but when it is done, there will be a few new businesses the city has never seen before. Ryan Costanzo photo USU GRAD STUDENT BLAKE THOMAS, left, is the founder of the musical group Cat Fever. He recruits friends like former Aggie Taylor Ross Wilson, right, to play with him in live performances. It began with a mouse. Virginia-native Blake Thomas studies renewable energy in the College of Natural Resources as a graduate student at USU. He also makes music and is the owner of a tabby cat named Odysseus, or Ody for short. Thomas’ band, Cat Fever, released their first extended play, or EP, this month. While Ody is the band mascot, Thomas said the band name has a different origin. A year and a half ago, Thomas lived in a house in Logan’s “Island” neighborhood and was “a dog person,” he said. Then he was bitten by a mouse in the night. “It was the creepiest thing of all time,” he said. “I had to go get a tetanus booster and it was fine, but it was just kind of a creepy experience.” The next day, Thomas and some friends took a road trip to Portland, where cats followed him everywhere, he said. “It was this weird, almost mystic feeling while in Portland,” Thomas said. “Everywhere I was going, there was a cat following me.” He said he slept at a friend’s house and woke with a cat on his chest, by his side and later on the tire of his car. “All of a sudden they became these noble creatures that protected me from mice,” Thomas said. “Then I just fell deeply in love with cats. I guess you could say I got cat fever and that’s where the name came from.” Thomas said he started making music when received his first acoustic guitar at the end of high school. He said he would casually pick out favorite songs from his favorite band, Red House Painter, and learn them. He said he wasn’t in a band until he came to USU from and became a part of the group F Dragon with friends. these noble creatures that protected me from mice ... I guess you could say I got cat fever, and that’s where the name came from. I’m a bit every member of society one guilt-andof a sports consequence-free angered rant per year. nut. I’ve Think about it. How relieving would it be worked in in this world of setback and trial knowing sports me- we have in our pocket the chance to transJust dia for a verse our emotions onto something else for a few time as long as we need to and just walk away? laughs long and in close It would be the “lowest exam score drop” circles have of life. That’s one less burden to carry, and a reputation we would all share in the experience. It’s of some- foolproof if anything ever has been. If and one who when this is approved and becomes a part knows what of everyday life, I suggest we all take time he’s talking and create our shortlists for those things about in we would be apt to rant about so we can most athlet- create the most quality blow up experience ics-t hemed possible. Here are a few of mine. discussion. It’s just something I get — like how some people understand math or — People who say “yummy” — I haven’t Shakespeare or the perfect milk-to-butter- a clue what it is about people who make to-powder ratio when making macaroni a concerted effort to be 5-years-old and and cheese. obnoxious, but there is no easier way to I’d say once per week on average, I’ll get pull it off than giving juvenile commentary a barrage of questions thrown my way in on a cupcake. Listen, the words we use regard to some sports topic that recently paint a picture for us. When something is occurred, and this week everything friends, “delicious” or “decadent,” we get a view family, colleagues, acquaintances, puppets of the value of good taste. Even when and the like have had one topic in mind: something is “scrumptious,” it doesn’t Richard Sherman. come off too playful. But If you don’t know any“yummy?” We’re not eatSteve thing about Mr. Sherman, ing that yogurt stuff from I’ll give you the three facts Schwartzman “Teletubbies,” so it’d be in that are most vital about your interest to quit using him for your social knowlvernacular that makes us edge. believe so. The privilege to verbally ‘spill our applesauce’ in times of frustration is a societal rite, and we should take those opportunities in stride. 1 — He is a defensive player for the Seattle Seahawks. They’re a football team and they wear blue and green. 2 — After making a play that helped his team clinch a spot in the upcoming Super Bowl, he was approached by damsel sports reporter Erin Andrews for an interview wherewith he, to put it in a language you young-in’s can understand, “lost his cool.” He openly trash-talked opponent Michael Crabtree by name, set a bravado of being the best at what he does and did just about everything else that would make one expect he was in a tag-team championship match with the Road Warriors at Wrestlemania VII and not a football game. 3 — He looks just like Sanka from “Cool Runnings,” minus the lucky egg. — Nut Roll — I’m only going to say this once Nut Roll, so listen very carefully. You are not a candy bar. That’s just the collar-popping truth, and the more you try to pretend you are, it makes me furious. Every time I see you creepily nestled in the candy aisle when I’m just trying to get my hands on a Charleston Chew in peace, I think of just how dangerous you are to society. A wolf in nuts’ clothing. Nothing with grainy protein ever satisfied my late-night hunger. If you want to fit in, I’m sure there is open-armed space for you at a Whole Foods somewhere, but not where people engage in more nougat binges. — Single-panel cheese graters — Are you trying to make me feel like a failure? There is one thing we as a society want — dare I say, need — and that’s to enjoy a perfectly good taco. You were given one job: to take all this big cheese and turn it into little cheeses to sprinkle on said taco. But no. You take it upon yourself to form an awkward shape, have zero gripping at the bottom and fail to remember the one scientific fact all of us remember: “Inertia is a property of matter” (Thanks, Bill Nye.) At the end of every attempt, you end up flat on a countertop covered in half-heartedly shredded cheese chunks and I end up flat on the kitchen floor in hysterics because the miracle of dairy-inspired gooeyness will never be mine. It hurts bad, and it’s like you don’t even care. Is there no shame? — Floam — What do you stand to gain as a bad Play-Doh and sand mixture? If you aren’t going to improve, then retire. Hopes From Page 4 duced and if the lyrics weren’t so bleakly nonparallel to the music. Both songs represent how overlayered this album is. Experimentation in music is not always a bad thing, but “High Hopes” proves that it’s not always a good thing.”Harry’s Place” offers some lyrical variety, hearing Springsteen sing about “downtown hipsters” and dropping the F-bomb a few times. The song itself could potentially be dark and rugged, but the synthesized strings in the background make it all sound like a joke. I know Springsteen has been experimenting with Celtic instrumentation in the recent past, but the use of it on “This Is Your Sword” makes me feel like I should be prancing through a green pasture in Brave more so than fighting next to Mel Gibson in “Braveheart.” On this album, Springsteen sounds best when the music is simplified. “Hunter of Invisible Game” and “The Wall” might come off as boring, but they’re the tracks with the best instrumental flow. “Just Like Fire Would” is pretty darn lovable if you just scratch off the Victorian coronet solo in the middle. I personally feel like Springsteen’s recent work has some chops on the production side of things, but even that aspect comes up short on “High Hopes.” With all the unique instrumentation, this album could potentially have a rich, bright sound. Unfortunately, this album sounds more like an order of nachos than a symphony; just layers and layers of cheese. It’s a bold move to release an album of studio outtakes, and even with titling the record “High Hopes,” I’m sure Springsteen knew this wasn’t going to be liked by everybody. If you think albums like “Wrecking Ball,” “Working on a Dream” and “Magic” were truly classics, chances are you’ll enjoy this album. However, I think this album will be forgotten in the near future and that The Boss will eventually rebound with music that’s at least worth hearing. Springsteen has gone through musical slumps like this before, but he’ll always try to be “tougher than the rest.” Should you try it out? Nah. I recommend the new Mogwai album, “Rave Tapes.” – Scott Hall is a new-comer to the world of journalism. He is currently studying public relations and stage management at USU. His spare time is dedicated to music. For more, email scottehall3@gmail.com. STUDENTS TAKE THEIR FIRST LOOK at the new mural in the University Reserve building. The mural was created by students in the Caine College of the Arts and was revealed Tuesday. From Page 5 — Travis Pastrana — So, I totally forgot why I put you on the list. You’re awesome. Never change. — People who granola their cereal — Stop, stop, stop pretending you’re eating healthy. Cereal was created to be the black-market flu shot of meals. Crumbly oatmeal flakes do nothing to enhance the quality of your Raisin Bran outside of it popping out in your Instagrams. I’m sorry, but someone had to tell you. utes of the day, and thought she was the one who would help him and his brother break the curse. Houck does a very good job about making you feel like you’re right there with the characters. She’s descriptive in her writing, to the point where you feel what her characters are feeling. At times, you’re even mentally — sometimes verbally — trying to tell them what to do when they’re not doing something that seems obvious. The wording can be a little confusing at times and there were a couple of grammatical errors, but nothing that is too distracting from the book. One of the things I liked the most about this book is that while Houck uses a lot of Indian mythology, you also see how some old myths all relate or even just get to learn about many different types of mythology or religion. Also, while it focuses somewhat on the romantic side of things, it does go into a lot of detail about the quest and other things that relate to that. The second book really hits more into the relationship side for the first half, but the first book focuses more on the actual quest. So far there are four books in the series, with a supposed fifth coming out. If you enjoy mythology and fantasy, “Tiger’s Curse” is a great book to read. Utah State football players have been receiving national accolades in the past week. Corner Nevin Lawson played in the East-West Shrine Game on Saturday. Lawson had three tackles in the game, a tackle for a loss, a pass defended and he recovered a fumble and returned it for a touchdown. The touchdown was the last points of the game, good for a 23-13 final score for Lawson and the East. Lawson’s three tackles were third most on the East squad. Lawson earned postseason third team All-American by College Sports Madness and first team Mountain West honors. In light of his performance in the East-West Shrine Game, Lawson was invited to play in the 2014 Senior Bowl on Saturday. He will join Tyler Larsen in the game. USU has now had a player in four out of the last five Senior Bowls. Will Mikayla Kapp photo Davis represented the Aggies SENIOR NEVIN LAWSON, seen here in action against USC on Sept. 21, represented USU in in 2013 and got an interception, Bobby Wagner went in the East-West Shrine game, in which he scored a defensive touchdown. Bleacher Report’s preseason Heisman watch list this week. Keeton is the only player from the Mountain West on the list that consists of 17 athletes, and he is one of nine quarterbacks. Keeton will go into his senior campaign fifth in active players for completion percentage and seventh in touchdowns accounted for. Keeton went down for the season with a knee injury against BYU on Oct. 4, but is expected to be back for the beginning of the 2014 season. Keeton was averaging 231.3 passing yards per game and 40.2 rushing yards per game along with 20 total touchdowns before his injury. The only other player from a non-power conference to make the watch list is BYU’s Taysom Hill. Before Keeton was injured, he was second in the nation in touchdown passes and points accounted for. Keeton also tied a school record for touchdown passes in a game with five twice in the 2013 season. Ashley Flygare photo JUNIOR FRANNY VAAULU goes up for a shot against a UNLV defender during USU’s loss to the Rebels on Wednesday. rebounds, totalling 44 overall to UNLV’s 34. The Lady Rebels scorched USU from the arc with 8-of-16 shooting. They also finished shooting 17-of25 from the foul line, including several late free throws that maintained the lead. “The girls know that we can beat anybody on a given night. We’ve just got to be more consistent,” Finkbeiner said. With 49 seconds left in the game, a technical foul was issued to each team following a short confrontation on the court. Stephanie Bairstow hit a free throw to make it a fourpoint game, leading to a UNLV timeout. USU’s defense held on the ensuing possession, and a scramble for the ball late in the possession was called under review by the officials ultimately giving the Aggies the ball with 17 seconds left. Two missed layups and a UNLV rebound silenced USU and ended the contest. USU fell to 8-9 overall and 2-4 in Mountain West Conference play. The Aggies return to action at 3 p.m. Saturday, Jan. 25 at San Diego State. In light of Richard Sherman’s outburst after the NFC Championship game I thought I would put together the top-10 most memorable interviews with athletes or coaches. This is another one made memorable by the commercials. However, it is genius in context. He simply wanted to explain to a reporter the point of sports. Edwards said, “This what’s great about sports, this is the greatest thing about sports … You play to win the game.” Nobody ever forgot what Edwards plays for after that. Given that this is probably memorable for the commercials, it still is a hilarious answer to a question. Mora was asked if he thought his team, the Indianapolis Colts, if they would make the playoffs. This was after a whole press conference where he expressed his dissatisfaction with the team’s five turnovers. Boeheim was angry at Katz about an interview about a year prior to this and let everyone know it. 10. Kevin Garnett, “Anything is possible” This interview can be memorable either because you think it is a nice display of excitement or just plain funny. While being interviewed on court after his first NBA championship, Garnett simply can’t contain himself. He cried, he mumbled, he stood in silence; he even told the reporter, Michelle Tafoya, that she looked good. Garnett then threw his head back and simply screamed, “Anything is possible,” “I made it Ma,” and “I’m on top of the world.” It was a bit cheesy, but he did just achieve a life dream. – Jeffrey Dahdah is a sophomore studying statistics and journalism. He is a die-hard Cardinals, Rams, Jazz and Aggies fan. He loves sports statistics and loves using them to analyze a sports and prove his points. If you have something to say to him, feel free to email him at dahdahjm@gmail. com or tweet @dahdahUSU. named the 2002 Grey Cup Most Outstanding Player. The veteran pivot became pro football's all-time passing leader in spectacular fashion at Percival Molson Stadium against the Toronto Argonauts on October 10, 2011, following a 50-yard touchdown strike to Jamel Richardson. In 2012, Calvillo became the first QB in league history to reach the 5,000-plus passing yards mark seven times over his brilliant career. He also threw for over 300 yards in eight-straight games, breaking Doug Flutie's single-season CFL record of seven, set in 1991 with the B.C. Lions. That season, Calvillo deservingly earned his tenth nomination as the team's Most Outstanding Player. Calvillo is one of the Alouettes' most active members in the community, particularly with Cedars Cancer Institute. You don’t like your air to look like it’s made of something solid that you can carve up like a turkey. Just so we’re clear, what exactly is racism? didn’t share her backward, Great-Depression era views. I’m sure my now-seemingly abrasive personality and sense of humor have left some with whom I’ve interacted feeling like I was the biggest jerk in the world. I’m sure some even thought I was racist. I feel like diversity specialists and civil rights enthusiasts would jump at the chance to inform and educate me about racism with vague definitions designed not to hurt feelings. I feel like unknowingly racist people actually need to be shown specific examples from their own lives about what is considered racist. It looks silly when I read it, but I’m guessing there are others who feel the same way I do, who have undoubtedly said or done something hurtful and racist without meaning to. If we really want to end racism, we need to inform others — OK, inform ourselves — what everyday behavior is unacceptable in today’s society. – Tavin Stucki is the editor in chief of The Utah Statesman. His articles have won awards and appeared in numerous news publications throughout Utah. Send any comments to statesmaneditor@aggiemail.usu.edu. Snowden is a traitor to America’s intelligence methods Most of this year’s Andy Pierucci freshman class was five years old when terrorists flew two Pierucci’s planes into Politics the World Trade Center, one into the Pentagon, and attempted to fly another into the U.S. Capitol. Some do not remember the uncertainty and pain that swept this country. I vividly remember Sept. 11, 2001. That day united America; we stood up from the ashes of the wreckage committed to finding those responsible for the attack and making sure it never happens again. We value our freedom; we fought a war for it. Liberty is not possible without security. To some, Edward Snowden may be seen as a hero. To me he is a traitor to this country and deserves to be punished to the fullest extent of the law. There is a fine line between maintaining our freedom and ensuring security. Debating that line is appropriate and necessary in order to maintain our liberties, but when that debate turns into a security risk, something must be done. There is a long history of whistleblowers in America’s intelligence community. Many whistleblowers have followed proper procedure when expressing their concerns. Snowden leaked classified information to a foreign media outlet. The U.S. House of Representatives and the U.S. Senate have intelligence committees. These committees can provide whistleblowers with a forum in which they can express their concerns and work to resolve them. Snowden’s rash actions have put Americans at risk and threatened to undo over a decade’s worth of work and sacrifice on the part of our intelligence agencies since 9/11. Some people who are unfamiliar with intelligence gathering wonder why this is such a big deal. Sources and methods are two of the most important and highly classified aspects in intelligence gathering. Sources are the foreign individuals who work with U.S. intelligence in gathering intelligence. Methods refer to the manner in which intelligence is gathered. This includes the tactics used by intelligence officers, such as the NSA’s monitoring and collection program. By leaking this information, Snowden made public our methods. Many terrorists have stopped using the telephone carriers and email providers implicated by Snowden. This has created a critical security risk. If our intelligence agencies can’t monitor terrorists, then the likelihood of a successful terrorist attack is increased manifold. I also think it is quite telling that Snowden fled to the open arms of Putin, former director of the FSB and the KGB, the Soviet Union’s and Russia’s CIA, respectively. There has even been talk amongst lawmakers that Snowden may not have been working alone, but as an asset of the FSB. The lawmakers suggesting this are Sen. Diane Feinstein, D-Calif., and Rep. Mike Rogers, R-Mich., the heads of the Senate and House Intelligence Committees, respectively. Snowden has denied this accusation, but it is a scenario that must be considered. Our intelligence officers put their lives on the line to protect this country. It is sad to see so many people deride them and praise Snowden. It is easy to sit in our comfortable apathy and criticize the sacrifices of others until another terrorist attack occurs. I’d rather err on the side of security. – Andy is a senior majoring in political science. He is currently the vice president of USU Pi Sigma Alpha, a member of the GRC, the Secretary of the Utah Federation of College Republicans and president of USU College Republicans. Today is Thursday, Jan. 23, 2014. Today’s issue of The Utah Statesman is published especially for Cameron Taylor, a sophomore majoring in nursing from Parker, Colo.
NO ADDING NO Dropping NO REFUND NO KIDDING!